Sprowston is a pleasant suburb of north-east Norwich, and a big one: if it were a town in its own right, it would be the fourth largest place in Norfolk. The Catholic Church serves Norwich's only other Catholic parish than the Cathedral, and there is a fine old Anglican parish church out on the edge of the urban area, as well as a pleasing 19th Century chapel of ease further in to town. About halfway along Sprowston Road sits Sprowston Road Methodist Church. Maybe it was the sunshine on this cold, bright January day, but I thought it looked lovely set in its wide lawn behind a hedge. It was opened in May 1958, and a pleasing mixture of pink and white bricks creates an almost luminescent effect in the bright sunshine. 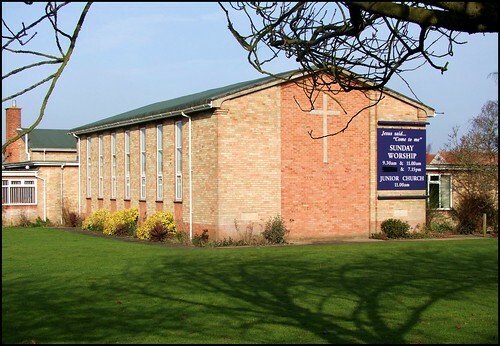 As with many Methodist churches, the buildings are often in use for other activities, and a matching hall sits at right angles to the main church facing on to a side road. The car park was full of cars on this Saturday morning. Intriguingly, a sign by the gate notes that this is also the home of Norwich's Chinese Congregation Methodist Church, and there were other notices recording the busy life of the place. Indeed, of all the churches along the Sprowston Road on this January day, this was the one which felt the liveliest, and the one which was most obviously at the centre of its community.